The day before we had to leave our host families in Suita, Oosaka, we were invited to cook some of the greatest dishes from Japan in the city hall of Yameda. We made Takoyaki (small flour balls of octopus with a coat of read ginger and vegetables), Yaki Soba (fried vegetables and lovely noodles), Ichigo daifuku (delicious small strawberries with a coat of sweet beans, and on top of that yet another layer of some kind of gummish rice-thing). We also made this international edition of maki rolls, a kind of rolled sushi (maki-Makeru means to roll in Japanese). The inside contains fresh fish and vegetables rolled in rice and seaweed. The funny thing about making these dishes was that they all were a lot different to us in a lot of ways. I had never seen a Japanese person make maki rolls with boiled vegetables and tuna. It gave me new inspiration because it is very different from the way I learned to make sushi in Denmark. 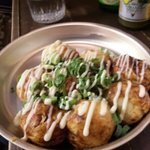 It was also really great to get the opportunity to make Takoyaki, because it famous in the Kansai area, and a lot of the group members where crazy about them. In my case, it was fun because my host family owned two popular Takoyaki shops, and after this course, I was able to help them in the shop. My favourite dish was probably the Ichigo daifuku, because it had such a fun texture (it was softer than wine gum, and still tougher) and because it contained my favourite fruit, a yummy red strawberry. The inside red strawberry even measured up with the strawberries from Denmark, which Danes are very proud of. After my trip home from Japan, I began to make Japanese food the way I was taught by my host families and the course, and everyone really loves it in Denmark. I would never have discovered these dishes without the World Campus Programs, and I will always appreciate that I had the opportunity to learn it in Japan.